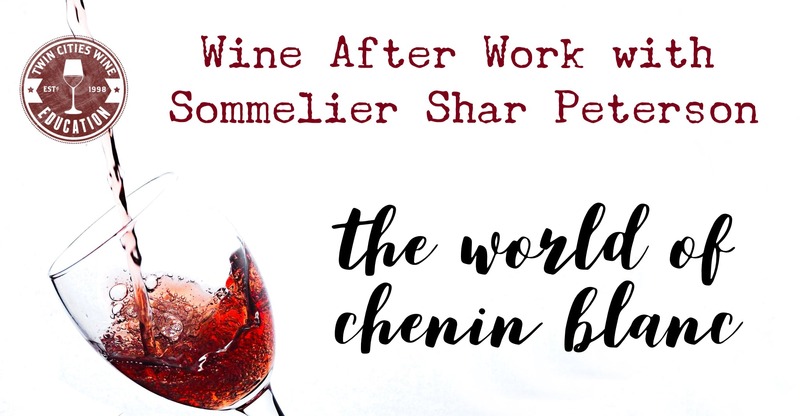 Twin Cities Wine Education is proud to present a fun after work gathering of wine and learning. There is a world of variety out there when it comes to Chenin Blanc. Sparkling, bone dry, off dry, dessert, and seemingly everything in between. Additionally, the range of regions that produce incredible Chenin is long indeed: Loire Valley, South Africa, Napa Valley, Santa Barbara, Washington, and even Australia. In this new class, we’ll deep dive into Chenin Blanc: where it’s from, what the styles are, and where the top regions are located. By tasting through a range of wines you’ll soon discover that this shape-shifting grape variety presents different personalities at every turn. We will also cover great food and wine pairing ideas for this favorite variety. As implied by the name, we aim to have these be fun after work events. The gathering is anytime after 5 pm, the class begins at 5:30, and ends around 6:30 pm. You are invited and encouraged to stick around for a meal afterward, of course. A couple of appetizers or a cheese board will be ordered for the table, but this is not a meal or a wine dinner. You’re invited and encouraged to stick around after at the host restaurant for dinner. How many people come to Wine After Work? Minimum of four people for a class, a maximum of eighteen. We want to keep these classes intimate and enjoyable. Can we arrange a private Wine After Work event for our office or clients?